Mix flour, salt, baking powder, orange zest and sugar together in a food processor, pulse to combine. Add cold butter cubes to food processor and pulse until the mixture becomes a grainy-like texture and no large chunks of butter remain. Put the mixture into a bowl and slowly add the cream while mixing together with a large fork. Once incorporated, turn the mixture onto a cutting board that is lightly dusted with flour, knead the dough just to combine. Roll the dough into a ball and press into a round disc about 1 inch thick. Using a 1 ½” cookie cutter, cut the dough into rounds and place onto a cookie tray with parchment. Brush the tops of the shortcakes lightly with cream and sprinkle vanilla sugar on top. Whip the cream and ¼ cup of the sugar until soft peaks form. Toss the berries with the remaining ¼ cup of sugar. When the shortcakes are done and cooled, slice in half, add the berries and whip cream in the middle. Enjoy with a glass of Chateau Ste. 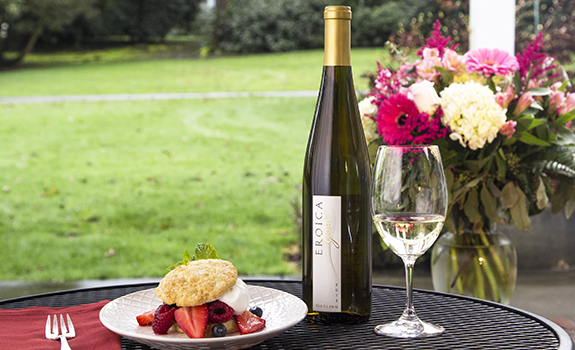 Michelle’s Eroica Gold Riesling!